Prominent & Leading Manufacturer from Ahmedabad, we offer courier software and courier management software solution. Software for the logistics industry. Courier365cloud - Courier software is an advanced, but easy to use, a system for creating and managing consignments. Packaging Details: Cloud-based courier software with an online order, messenger, courier tracking for delivery dispatch. The complete delivery software solution. Sign up for a trial. 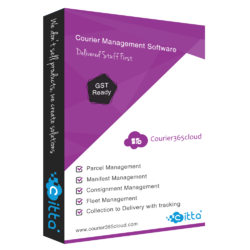 The courier management software solution is easy-to-use, courier software solution specifically designed for the courier, messenger, expediting and distribution industries. Packaging Details: The purpose of the Courier365cloud is to build an application program to reduce the manual work for managing the Courier, Customer, Email Notification, Delivery. It tracks all the details about the Delivery, Bill and Payment.